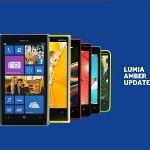 Nokia Amber update is expected to be released to Nokia Lumia with Windows Phone 8 devices start from August 14th 2013 for Telstra and Vodafone. There are some new features that coming together with Amber Update. The key features are Nokia Glance Screen, Data Sense, FM Radio (selected Nokia Lumia), Nokia Smart Camera Application and many more. Folks from Unleashthephones.com posted a hands-on demo video of Nokia Lumia 920 with Nokia Amber update. From that video we can view some new features from the Amber Update. So let's watch the video first. Glance Screen Clock Charging indicator / low battery Indicator for silent / vibra mode, night mode. Flip to silence: Flip the phone to turn it silence. Date of Sense: Managing your data flow monitor and control data usage Optimally compressing web traffic. Find your closest hotspot Enriched web services. We will keep you updated for availibility of this Nokia Amber Update. Keep on our timeline & blog. Stay Tuned.